This entry was posted in book review and tagged contemporary, new adult, rainbow rowell, romance, young adult by janicu. Bookmark the permalink. This is my first experience with Rowell’s writing, so I couldn’t tell you about her other books, but I’m happy I tried this one. I hope you enjoy it if you ever give it a go. It’s very much character driven (which I like). I felt like I was so interested in what the characters were saying and doing and thinking that the writing itself just faded into the background. P.S. I LOVE this review. Yup, this is smack dab in college-time (and I am not sure I mentioned it much here but there is talk of classes, especially Cath’s creative writing one). I SO want to read this book, and now I’m more excited than ever! Great review…and I am totally jealous of you for getting an ARC. Can’t wait till it’s out! This is a case where listening to the buzz did me right! I hope you do give it a try. I suspect there’s going to be a lot of positive reviews which will turn people off because: HYPE, but I REALLY DID like this one. I read this back in May, right after I was approved on Netgalley, and it was way too early to write a review. But now it’s getting more timely – I shall rectify that soon. Though it’s my last favorite of her books, I love how different each has been and what she chose to tackle in this one. It was totally unpredictable and I came to like that. Also, so easy to fall into, and the read alouds between Cath and Levi? PRICELESS. Ah cool. Looking forward to your review. One day I will get around to Eleanor & Park and Attachments. Interested to hear what made this your least favorite — I know when I was reading I was judging certain people so hard (heh! ), but after I finished I came to like how the characters got to make mistakes and had to figure things out after making their mistakes. 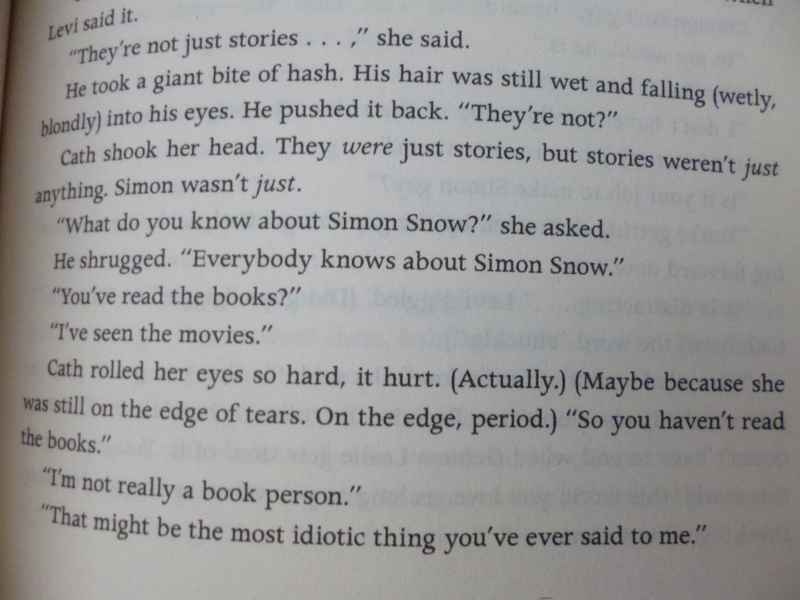 It kind of deepened the book for me. Yes, the read-alouds. I looked forward to those! Hm. I was not enamored of ATTACHMENTS. Started and bailed on E&P (though I may return someday). But you make me want to give her another shot with this one. So well done you. Love the photo, btw. I get a little thrill out of peeking into other people’s copies of books. Ah well, I try my best. 😛 But that gene, sometimes you don’t have it for a certain writer. Okay, I just realized that I haven’t commented on your review! I think I first read this review on my phone so I sent a tweet instead of commenting. Anyway, glad you enjoyed reading this one because I’m definitely planning to read it. I had so much fun reading Attachments. I have Eleanor & Park on my bookshelf now, I hope I can read it soon. 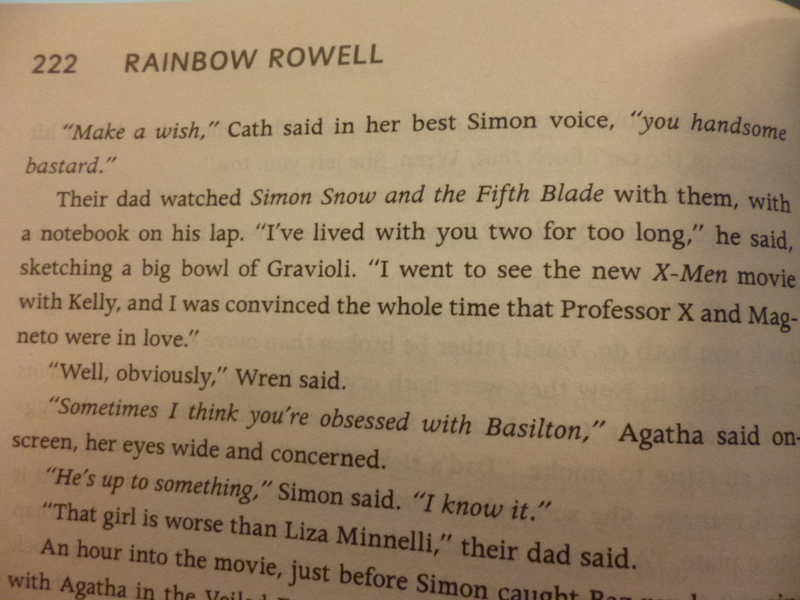 What’s great about Rainbow Rowell’s books is they’re so very different from each other. I hadn’t realized her books were so different. I tried Attachments but I don’t think I was in the right mood or I was distracted and not really getting into it. I ended up returning it to the library. I think I’m going to go for E&P and then maybe come back to Attachments. 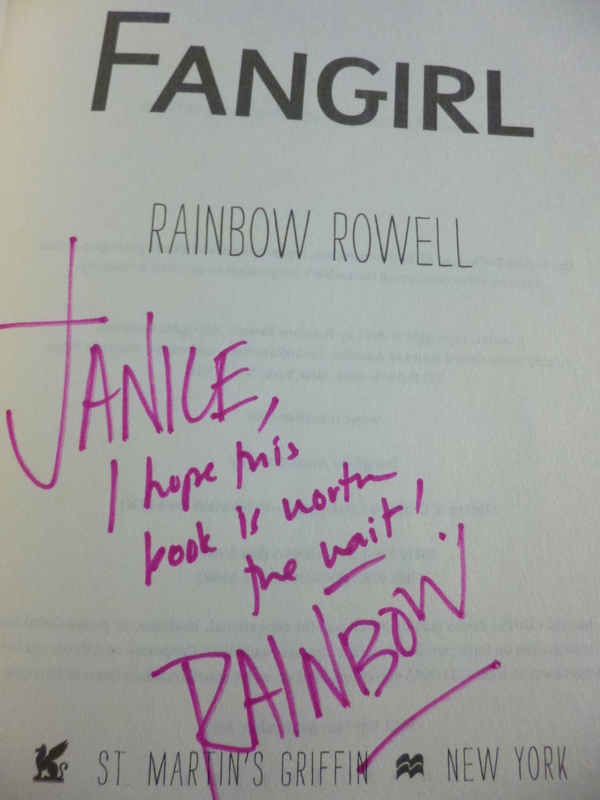 ETA: I’m glad you’re planning to read Fangirl. It’s my current favorite! Heh. I am trying to be better about commenting! I feel like I don’t comment as often as I used to. Oh you’ve tried Attachments before? Sorry to hear that you weren’t in the mood for it when you first gave it a try. But it’s good that you’re still interested in reading it. It’s kind of a slow, quiet romance but I enjoyed it. Probably because I could relate to the office setting and the characters are the same age as I am. I think that maybe someone was having health problems in the story (do I remember that right?) and it was too close to home because I was worried about someone I know. It made me feel like I wasn’t escaping. I’m probably in a better head-space now. Agreed — I LOVED that this is exactly what New Adult should be. We should be talking about this age range, not sexing everything up. I LOVED how Rainbow can say so much without directly saying it, if that makes sense. She’s got such a brilliant way of writing and it just gives me the warm fuzzies! I actually had a couple issues, mainly with Cath, because I just became bothered with HOW introverted and closed off to the world she was. I think she just didn’t make as much progress as I was anticipating so I was a bit let down, although I completely understand it. Just another time where my expectations got way too far ahead of me! 🙂 Still really enjoyed it though. Wonderful review! Loved reading your thoughts on this! Cath is one of the more “scared of the world” characters I’ve ever encountered! I felt a bit impatient with her at first too, but she grew on me and told myself that I’m supposed to be introduced to people who aren’t like me in books. I definitely see where you’re coming from though. I’m most relieved that she found someone to eat with at the cafeteria so she wasn’t eating her energy bars by herself like a sad puppy. If she had kept doing that I would have had a harder time. Hello! I stumbled on your review while checking on the release date for Fangirl. I’m even more excited now and I want to add whatever encouragement I can to read Eleanor & Park and Attachments soon! I read both books in two consecutive days. Both kept me awake until 4 am; one compelled me to sit up straight and weep with abandon while the other caused me to burst into giggles every ten minutes or so. Wonderful, very different books. Rowell is an absolutely lovely writer. I instantly became a loyal reader. Cool, I love when people who are excited about books stumble on my blog! And you are mighty persuasive too. Books that make you stay up late and weep or laugh are the best. Alright, alright, I am going to go with the peer pressure of pretty much everyone :). I will read those books.